Directly convert video for playing on Zune, iPod, Apple TV, iPhone, PSP etc. Powerful video editing functions including video cropping, video trimming and video joining. 4Easysoft MP4 Converter is an easiest-to-use MP4 Video Converter which is designed to convert almost any video formats to MPEG-4 standard formats, such as AVI to MP4, WMV to MPEG-4. In addition, the MP4 Video Converter provides a powerful way to convert video and audio files to MP3, M4A, AAC, AC3, OGG, WAV, etc. 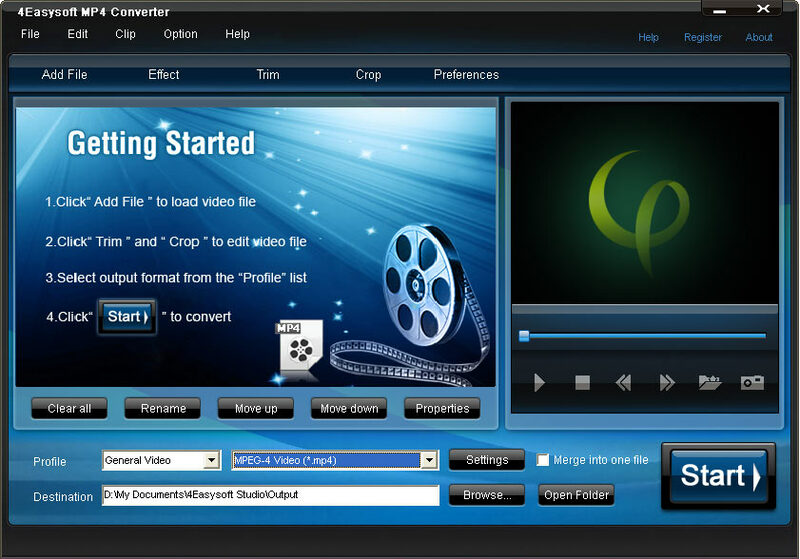 This MP4 Video Converter also provides you with flexible video editing options. You can crop video, trim file segment, watermark video with image or text, etc. These features make 4Easysoft MP4 Video Converter the best solution to enjoy your favorite video on iPod, PSP, iPhone, Zune, Creative Zen Vision, etc. An easy way to convert MP4 to AVI? How to convert any video to MP4 format?